We make it a point of pride to ensure your every need is taken care of. Relax in stylish comfort and dine on sensational cuisine as you drift along picturesque riverbanks, then moor for tailor-made excursions. Our customised itineraries range from truffle hunting and go-karting to hot air ballooning and horse-riding. A champagne reception on deck marks the beginning of a remarkable voyage. Savour a slower pace of life as you spread out on deck or in the luxurious interiors. 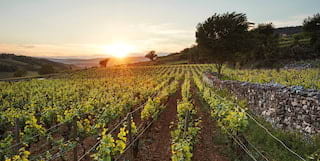 Then head ashore to discover the art of truffle hunting or the secrets of the Grands Crus vineyards. 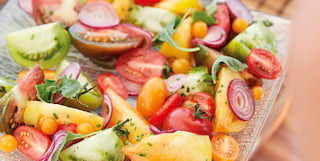 Accompany your chef to the market and pick out fresh produce for the evening’s feast. Onboard and off, every need is taken care of––just sit back, and let your senses set sail. If you’re searching for a family-friendly break in France, step aboard as we set sail on a luxury river cruise. Discover our top tips for an unforgettable, fun-filled adventure for all. Survey panoramic views of verdant Burgundy from aboard our cosiest barge, Belmond Alouette, as it winds its way down the grand Canal du Midi. Belmond Amaryllis delves the secrets of the historic vineyards, villages and cities of Burgundy, drifting dreamily along the Canal de Bourgogne and the River Saône. 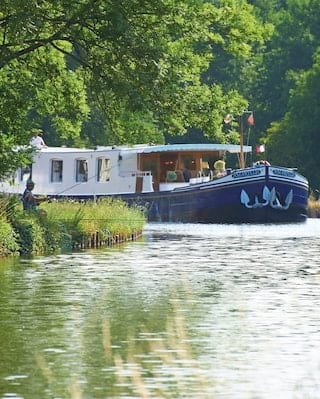 Ornate fabrics, four-poster beds and a grand piano can all be found on Belmond Fleur de Lys, which spirits you in style along the Canal de Bourgogne and through the Ouche valley. 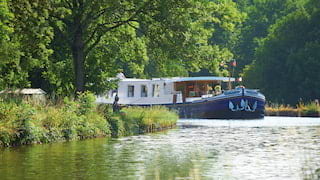 Our most majestic barge is perfect for larger groups. Anticipate lavish feasts, and sipping iconic wines and cocktails on deck beneath a canopy of stars. Explore vintage vineyards and pretty riverside towns as you glide along from Chalons-en-Champagne to Epernay. 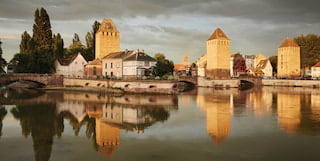 Discover a landscape brimming with flavour and heritage on a luxurious cruise from Dijon to Saint-Léger. Named after the peony, step aboard Belmond Pivoine and into a world of sensory delight. Hop from vineyards to breweries to chateaux, sampling local delicacies along the way. On board you become a family. That’s why guests keep coming back—they feel like it’s a welcome home. The phenomenal sights might stay on your mind, but it’s the personal connections that stay in your heart. A convivial crew, including a captain, hosts and chef, are on hand round the clock to ensure every aspect of your voyage is exceptional. 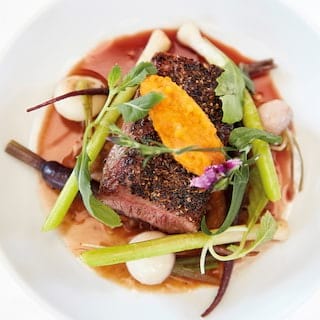 Seasonal menus of local specialities include signature recipes from your chef. 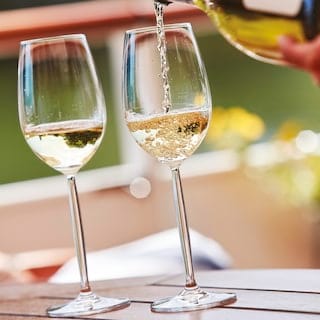 Sample the best regional wines during lunches and dinners. When the surroundings are so breathtakingly beautiful, why rush things? 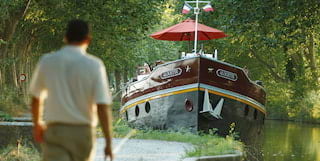 Our seven luxurious barges give you the chance to relish every moment of your journey as you glide through the celebrated waterways of southern France. 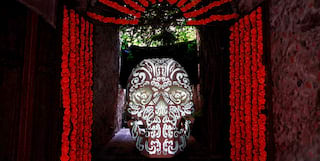 Savvy travellers are increasingly on the lookout for multi-generational, immersive and bespoke experiences. This spring, families can find the complete package for an adventure extraordinaire through Burgundy aboard Belmond Afloat in France. There’s a reason that those who have visited the South of France enter a kind of reverie when you ask them to describe their journey. Step aboard as we explore some of the country’s finest flavours. Winding honey-coloured streets, pretty squares and captivating, vibrant boutiques—the wine capital of Burgundy is a treasure trove of delights, just waiting to be discovered. Let us be your guide. Wine, religion, power, politics, money. 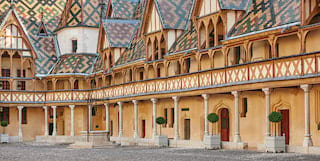 All are deeply entwined in Burgundy’s history.